Is anyone else helplessly addicted to the game Angry Birds, by game developers Rovio? We are, and from the looks of things, there are a huge number of other people who suffer from the same affliction. 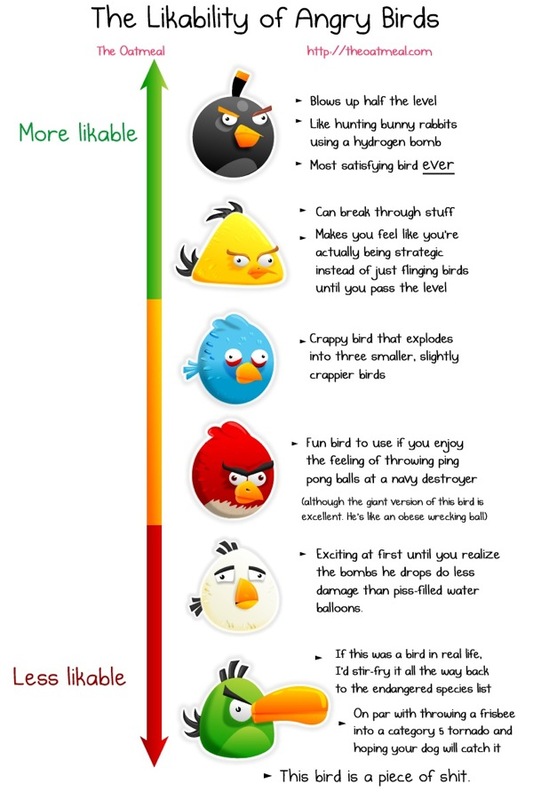 If you have yet to be hit by the Angry Bird bug, and aren't quite sure what it's all about, here's a brief description. Angry Birds tells the story of a group of evil pigs, who have stolen all of the eggs from the bird population. A range of birds, with different talents, are called upon to enact revenge upon the pigs and claim back the eggs. As a game, that translates into various levels where little green pigs hide amongst structures of wood, stone, ice and snow (depending on the game or level) and you are in control of the birds, which you fire from a sling-shot in order to try and destroy the pigs. Every level comes with it's own challenges, and birds range from ones that can crack wood to ones that are only really useful for ice. Birds that blow up to ones that behave like a boomerang. You have to use these birds to not only kill the pigs, but to also seek out golden eggs for rewards, and to score highly enough on every level to be awarded 3 stars for your effort. When we're not playing Angry Birds of course, we do spend time scouring the world wide web for all that is interesting and unique in the creative sphere. What we started to notice, and what caused our proclaimation of love for Angry Birds today, is that this game has spawned a wide range of Angry Birds art! The Oatmeal has brought us a brief, but truthful comic, outlining the feelings of 99.9999% of people towards the various feathered characters of the game. We all love the bomb bird, and remain slightly perplexed at why the boomerang bird was ever invented. 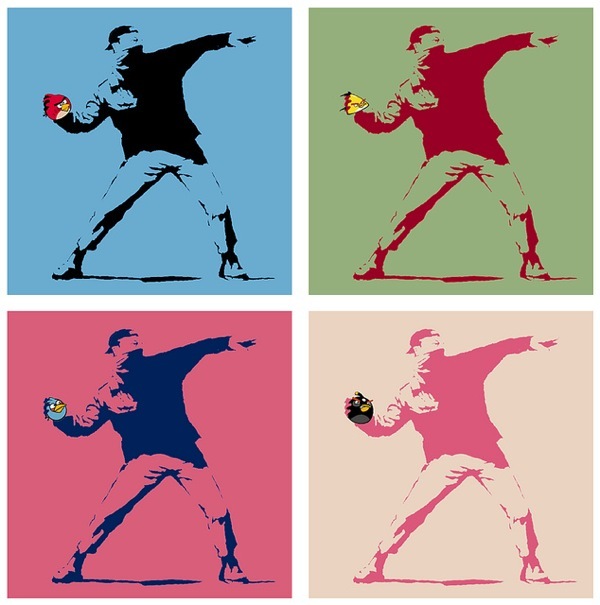 Brought to us, and sold to us as prints by creative spirit Bortwein, this artwork is an entertaining play on the graffiti art of Banksy, and repeated image style of Andy Warhol. Check out Bortwein's website for some other great prints that play on popular culture. 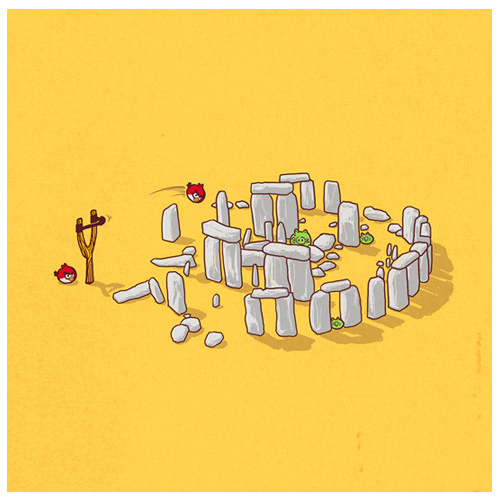 Another graphic designer with a sharp eye for what's hot and what's not, Yau Hoong Tang, brings us the Angry Birds, taking on wonders of the ancient world in order to destroy their piggy enemies. This really made us laugh, which just shows how bad our addiction to Angry Birds really is. A good old fashioned mash-up between the recent version of futuristic gaming move TRON and the 2D game play of Angry Birds. Don't forget to grab you copy of Angry Birds, on the App Store!